The Assets inquiry option provides a central data entry point for all assets, allowing the user to incorporate full control over the asset database. Assets Inquiry has been designed to contain a number of pages to assist the user by managing the asset through supporting the wide range of user queries. These queries can include password history information for hardware and software, location information, warranty information, asset depreciation information, or to identify what colour, model, or make the asset is. More specifically, these pages include the following details and depreciation information. The Passwords management system allows passwords for hardware, software, and software services to be managed, including having full history of any changes. This is the calculation of multiple depreciation schedules in relation to the company assets. Only one depreciation schedule may be transferred to the General Ledger. This covers the ATO Standard, plus the Company required value, i.e. : your Company may wish to retain a record of the WDV Tax value, plus the potential WDV sale value. It is suggested that only the transactions relating to the ATO Standard are transferred to SapphireOne, while the Company transactions are kept within Assets, to give a true reflection of the assets worth. The purchase, sale and control of your company’s assets are achieved with ease. This includes the ability to record locations and the staff responsible for the asset. Also, the asset details regarding warranty, repairs and loans can be tracked, allowing full recording of the assets life in the company. Information pertaining to the Asset itself can be found in the details page. The Details and More Details pages allow for the entry of the asset name with description up to 32000 characters, the class that the asset belongs to, where the asset is located, who is responsible for the asset and their contact details. There is also a description text field (to allow the entry of information describing the asset) as well as fields providing warranty information, insurance details, notes and general ledger accounts. The depreciation page provides asset depreciation information for both tax purposes as well as company purposes. Both have the suggested depreciation rates including the common Straight Line method, as well as diminishing value and cost-price methods. The tax information is the only information is transferred to SapphireOne Financials General Ledger. Class Inquiry allows the grouping of Assets into common areas. This is not limited to one class and actually allows for a super- and sub-class. For example, the super-class of an asset can be a class called office equipment, and the sub-class can be the department, such as administration. The Class Inquiry page also allows for the entry of any notes or actions pertaining to the asset. Passwords are a valuable asset to any company, as your company’s ICT or systems administrator will tell you. Full password details can be tracked, including who owns the password; hardware, software, or software service that the password is for; full user name; short user name; activation date, deactivation date, if currently active, and which system users have created and updated each record. Each password record has a unique number, so they can never be confused, and this allows a full history of each password for a username or hardware to be kept. Location Inquiry enables the tracking of an asset, including where it is located geographically. Similar to Class Inquiry, Locations Inquiry provides asset class information but also includes address, contact name and telephone information. Department inquiry allows you to group assets within a location. It is a centre for a variety of department and asset information. Details such as names, notes and general ledger accounts can be entered here. In addition to these pages, department inquiry contains a valuation page displaying the total valuation of Assets for the department based on tax or company calculations. A unique function of the SapphireOne Assets mode is to allow for the recording of a varied source of information about the asset, as well as enabling users to keep a visual record of the asset. The photo record of your asset allows for easy identification of that asset, which is especially useful when authenticating a business’s asset registry. Contact Inquiry allows the recording of contacts and the linking of assets to those particular contacts. Although the recording of contacts is staff normally, contacts can also be service agents, sales agents or repairers. The user is also able to link the asset to any particular contact. 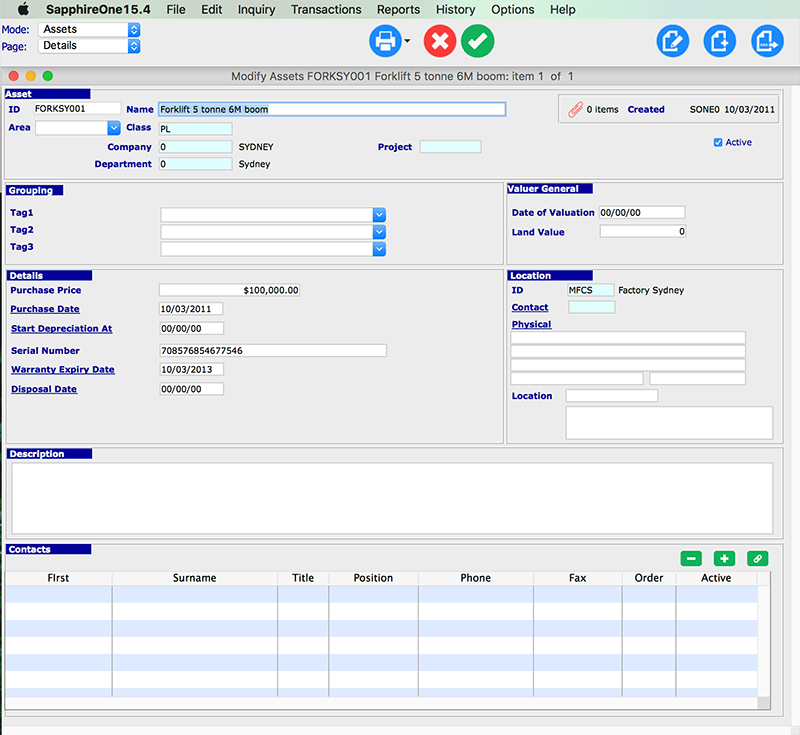 A function unique to the SapphireOne Assets mode allows for the recording of varied sources of information about the contact, enabling users to also keep a visual record of that contact. The photo record of your contact can benefit the security of your organisation through ensuring access only to authorised agents. Depreciation methods can be created for insurance, tax or valuation purposes. The primary and secondary are displayed on the valuation page. Only the primary method is transferred to SapphireOne Financials, and would therefore be the tax depreciation method. Custom provides the ability to customise any information required by your company. Providing a variety of field types, the information you can record here is not limited by the type of fields available as the user can change the field labels by using the change names function. Information such as additional contact names, departments, phone numbers, dates of service checks or repairs can all be stored. Correspondence with a particular contact name can also be placed in this area. The Inquiry menu of assets module allows the maintenance of records stored in the database. The main area of control for assets. For the classification of assets. For the tracking of where the asset is actually located. This is for the storing of Passwords, Serial Numbers Keys etc. for any asset. For the grouping of various sections or departments within a location. For the tracking of who is responsible for the asset. For the accounts to be used when updating the Accounting system. To allow the recording of vendor information relating to the purchase and payment of an asset. Allows multiple methods of depreciation to be set up. Each asset can be linked to a particular classification, location. By default, only Assets that are set as active will be displayed. This is the list in the Bondi Blue Demo that is displayed when the Include Inactive selection is made from the Tools Menu. Details section contains many sub menus: Details, More Details, Custom, Depreciation, Valuation, Method, Transactions, History Transactions, History by Period, Computer Equipment details, Keywords, and Notes. This Details page provides the base details of the asset. The Asset’s ID, Name, Company that it belongs to may be recorded here. These items are required before the user is allowed to save the Asset with the green tick. The user then has the option of linking the Asset to a Department, a Class and a Project if needed. If a project is entered and depreciation is run, it will then be linked to the Depreciation Expense Account. Additional details may be entered in this area. The purchase price and the date the Asset was purchased. Serial numbers and warranty expiry dates may also be recorded. If an Asset Disposal transaction is created the system will enter the date that the disposal was created in the Disposal Date data-entry field. The More Details page provides the ability to record insurance details, barcode data, estimated usage and General Ledger Default Accounts. The precedence for G/L accounts for an Asset is as follows: Asset Inquiry, Asset Class TO, then finally Company Inquiry Asset Control Accounts. The system will check each one in the order above until it finds a valid G/L account to auction any transactions to for the Asset. This provides the ability to record the Cost Price Limit as applicable to Luxury Motor Vehicles (as is the requirement in Australia) and any Business Use that is applicable for the Asset from zero to 100%. Since this limit is varied from time to time, provision has been made for the user to enter this limit. The screenshot here is for an asset that is a Motor Vehicle. Once the ‘motor vehicle’ checkbox is selected the ‘Cost Price Limit’ will be displayed as seen in the screenshot here, enabling the entry of the current Cost Price Limit. In Australia, as of the 2010/2011 financial year, the limit is $57,466 inclusive of GST and Luxury Car Tax. This limit will alter as the years progress, so for more information visit the ATO website for up-to-date details. The Primary/Tax and Secondary/Company depreciation schedule information is also displayed on this page. This area contains the Opening Written Down Value and the Depreciation for this year, and last year is displayed as calculated by the system. Other items such as Expected Life, Residual Value and the Type of depreciation are user-entered. If the Asset purchased has an initial value of less than $1000 you may select the checkbox and the Asset will be placed in the low cost pool. If the Asset has an initial value of over $1000.00 and the depreciation is set at Diminishing Value you may select this option to move it into the Low-Value Pool automatically when it’s written down value drops below $1000.00. The Asset may also be placed in the Software development pool. This is a special pool for software developed by that company. These Assets are depreciated over 4 years at 0, 40, 40 and 20% straight line. Company Area: Apart from the official ATO tax rates for an Asset, the company may also elect to depreciate the Asset at different figures to the tax office and the user may enter these figures into this area. If they are entered the system has the ability to record, track and report on these figures for the Asset as well as the Official rates for the tax office. This page displays the Primary and Secondary Depreciation Schedule information. This displays a summary of the depreciation schedule available for this asset. Displays all current transactions relating to the asset. Note that in Bondi Blue all depreciation is merged into the single General Ledger journal. When this Page is selected that system will display in the list all transactions that have been auctioned against this asset. The Asset Class Inquiry provides the option to group Assets, such as Furniture and Fittings, Plant & Equipment etc. See the screens here. The General Ledger Account details in the Asset will be automatically filled in from the details here when you green tick. However, if you then go in and alter the General Ledger details in the Asset itself the alterations in the actual Asset will take precedence. This allows the tracking of where an asset is stored. A Location Inquiry also allows the grouping of similar types of assets within a Location while providing contact details. This is the MFCS class in Bondi Blue and note that the entering of a Company ID is provided for. For company, specific logins, the Company ID that the user is currently logged into will be inserted by default by the system for any user who creates a location. You should be aware that no Company ID will mean that ALL users across all companies will be able to see the location thus created. In the Location area, the Location ID and name are entered/displayed as well as the Class, Company and Department details. The Details area holds additional information relating to the location. The lower part of the window displays all of the Assets that have this location as a location declared. The Password Inquiry function allows the storing of passwords within the SapphireOne system. Since passwords, in essence, are a very sensitive issue, access to them is restricted at several levels. This Password function is also accessible from the Inquiry Palette menu and is identical with the Password Inquiry here in Assets Mode. This function will enable you to store passwords for any asset or program. An asset may be physical (computer, external drives, USB drives, etc. ), software or virtually anything. Selecting passwords from the Inquiry Palette will display a list of any passwords already stored in the system. This allows the recording of contacts and allows the linking of assets to a particular contact/s. The Contacts Inquiry list seen here may be accessed from a number of areas within SapphireOne. All assets must be linked to General Ledger accounts and these accounts must be set up before attempting to set up Assets. SapphireOne will then display a full list of General Ledger accounts already in the system, as seen in the picture here from the Bondi Blue demo company. From there you may view or modify existing General Ledger accounts or select the new ‘plus’ button to create new General Ledger accounts that will be required for Assets. Accounts \ Payables \ Vendor Inquiry.